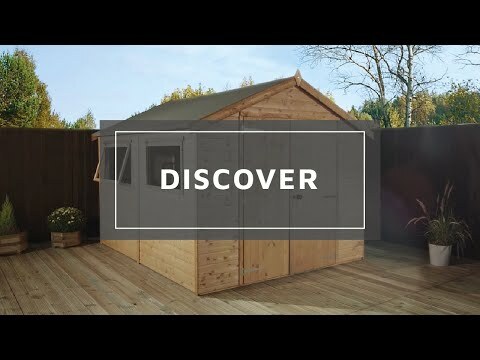 This Waltons 16ft x 10ft Reverse Apex Wooden Workshop is a high quality garden building that offers plenty of space to create a fully functional garden workshop. Featuring a classic design, this workshop will suit any style of garden and will provide many years of service. In order to create solid walls that will look great throughout the life of the garden shed, 12mm thick tongue and groove cladding has been used. Tongue and groove cladding interlocks with each other to form a robust panel that prevents water ingress. To ensure the floor and roof are strong enough to withstand use as a workshop; they have been manufactured from 12mm tongue and groove cladding. Thick 2” x 1” wooden interior framing provides a sturdy structure for the walls, roof and floor to attach to. Double doors provide a wide entrance that is perfect for storing large items such as garden equipment and tools; a rim lock is supplied for additional security. A single opening window allows plenty of light into the interior, providing a bright and well ventilated work space. This window is made from 100% shatterproof styrene glazing, a safer alternative to traditional glass that is ideal if you have a young family. A classic apex roof design offers more head room inside, ideal for storing tall items such as sports equipment. Heavy duty mineral roof felt is included with this garden building to offer protection against adverse weather conditions. Our Reply:Good morningThank you for leaving your feedback today. i am sorry that you had some damage and missing parts with your order. Can I ask you to contact our customer service department who may be able to assist you with this. Review:This was a 20’ x 10’ workshop! How strange, sorry we've provided the incorrect product for your feedback! Thank you for providing your comments above however. Review:Not all the long wooden supports were used. Is this usual?